Camping- As you drive into Pine Lake the road dead ends in the camping loop. There are 12 semi-primitive sites with gravelled parking spurs. Each site has a picnic table, fire ring, and a lantern pole. No electric. Services provided May 1- October 1. Boat Launch- As you drive around the Pine Lake camping loop, the boat launch is almost all the way around, after site 12, and before the latrines. Sandy beach slopes into the water. Power boats allowed, but no water skiing. The description begins behind campsite 1. There is an old woods road which is now closed, but makes for a nice hike, although not a marked or maintained trail. Proceed west on a raised berm through bottomland hardwood swamp, and a small pine plantation for 1/4 mile. At this point the road forks. Enter an area of young shadbush and white pine. After another 1/4 mile come to a T, with a maple growing with a cluster of a dozen trunks at the junction. The area is largely white pine and aspen with sandy soil. Take the right turn. Proceed slightly downhill for 1/8 mile to another apparent junction. Continue straight to quickly reach a creek, or turn right to quickly dead end along the creek. This "trail" meanders through the woods for about 3/4 mile. At one point you follow a ridge edge on, then drop down to the right, and turn left, continuing the same general direction as before. The path eventually comes out at a Forest Road, possibly one which ultimately connects with Pine Lake Road, but I have not had time to check this out yet. Access- Campsite 1 is for the Camp Host. If you walk to the back (west) of this site, you will easily see an old woods road heading west. Restrictions- Old road is blocked by posts, no motorized vehicles. Distance and time- Estimated .78 mile to follow the right fork, and 1.25 miles if you follow the right fork. I hiked 15 minutes from the fork to the left end, and 20 minutes from the fork to the better road. Measured by pacing, at which I am fairly accurate. Other Points of Interest- there are several very large white pine on the Right Fork. Bicycling- The old woods roads here would be satisfactory, although not technical biking. Picnicking- As you drive around the Pine Lake camping loop, picnic area access is just after campsite 10. Walk to the right, away from the loop. There are 2 grills and one picnic table on a wooded low bluff above the water, trees in shade. Table and grills adequate but not wonderful. Small beach access is near the picnic area. Swimming- As you drive around the Pine Lake camping loop, beach and picnic area access is just after campsite 10. Walk to the right, away from the loop. There is a very small sandy beach. Possibly a good place for the kids to have fun while the family picnics. Although there is a small area of sand, this isn't much of a beach, and it is not officially listed as a swimming area. Access- Drive in on sand road from Bosschem Road. There is limited parking for people who are not camping, near the latrines, but you could possibly park on the grass nearer the picnic area. Restrictions- No glass or animals on beach. Officially closed in winter, but can be used. Loop drive is one way, counterclockwise. No water skiing. Ecosystem- Inland kettle hole lake, with no stream inlet or outlet, surrounded by wetland, white pine, maple and aspen woods. Additional Facilities- Wellston Area snowmobile trails are nearby which may be hiked in summer. In lieu of the Forest Service parking fee, Interagency passes are also accepted. Display on your dashboard when you park. 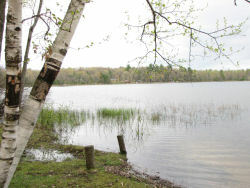 To reach Pine Lake from M-55, turn south on Bosschem Road at Wellston (17 miles east of Manistee, or 8 miles west of M-37). Go south 1 mile, then turn right (west) on Pine Lake road for 3.5 miles (following several turns) to reach the site.